Restaurants open, restaurants close. But with Asian restaurants, there is seemingly a revolving door of name changes. Sometimes, they don't even change the name such as the case with Golden Pizza & Sandwich. It is a Vietnamese restaurant that kept the original name of the previous restaurant. 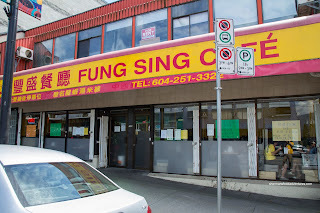 This is not the case with Fung Sing Cafe on Hastings as it was Sun Yee Cafe before. However, it is still a Hong Kong-style cafe and was our choice of eats after Sunday morning hockey. Seeing how I had another hockey game later in the day, I decided to load up on calories by ordering 2 meals. 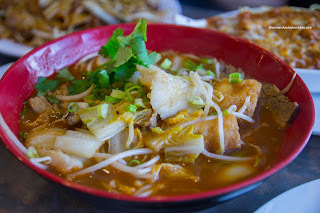 I started with the DIY Soup Noodle with a lobster broth and rice noodles topped with brisket and sliced fish. The lobster broth was not exactly screaming out with flavour, but I did get some essence. It was somewhat thick which was almost bisque-like, yet in the end, it was not bad. The rice noodles were plentiful and nicely chewy while there was plenty of veggies on top. I found the brisket to be quite fatty which meant the meat was moist. The basa was cooked just right being flaky and soft. For my second item, I had the 2-Item Combo consisting of Ox Tongue and Chicken Steak with black pepper sauce. It was accompanied by al dente spaghetti and frozen veggies (except for the broccoli). 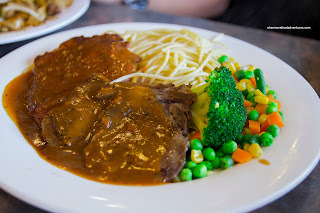 The thinly- sliced ox tongue was soft and fatty while the chicken steak was juicy and fried a golden brown. I found the black pepper sauce to be flavourful and mild with a nice consistency. 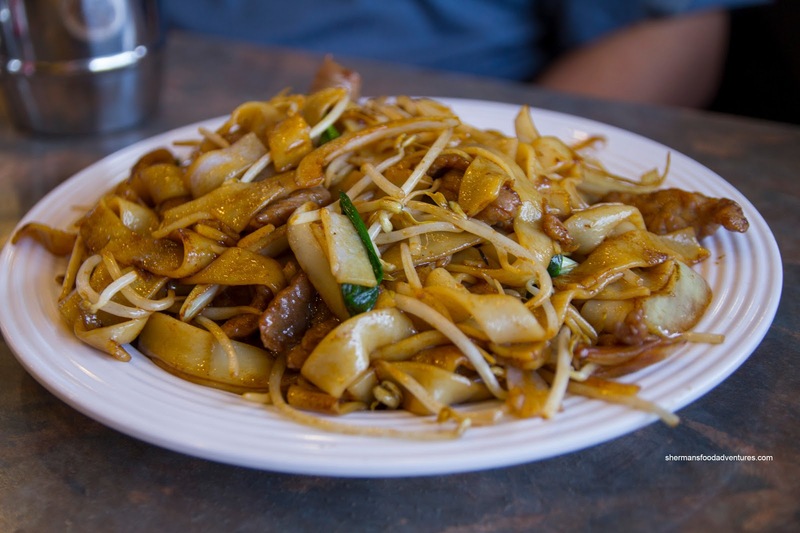 Not to be outdone, JuJu ordered 2 items as well starting with the Stir-Fried Flat Rice Noodles with Beef. It arrived with an aesthetically-pleasing caramelized dark soy colour where the dish was not that greasy. The beef was tenderized beautifully as it had a nice chew while being tender. The dish was seasoned just enough where it was flavourful without being salty. His second dish was the Baked Spaghetti Bolognese. 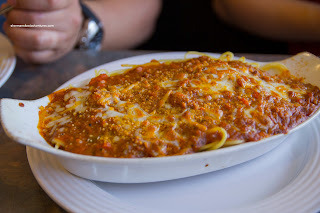 For those unfamiliar, you can't confuse this with the real Italian dish. Sure, there is beef, carrots and onions, but that is where the similarities ends. In this HK-style cafe version, there is star anise and plenty of sugar. The one here was pretty typical with a nice thick consistency with a good balance of sweetness and savouriness. The noodles were not only al dente, I found them to be a little dry. 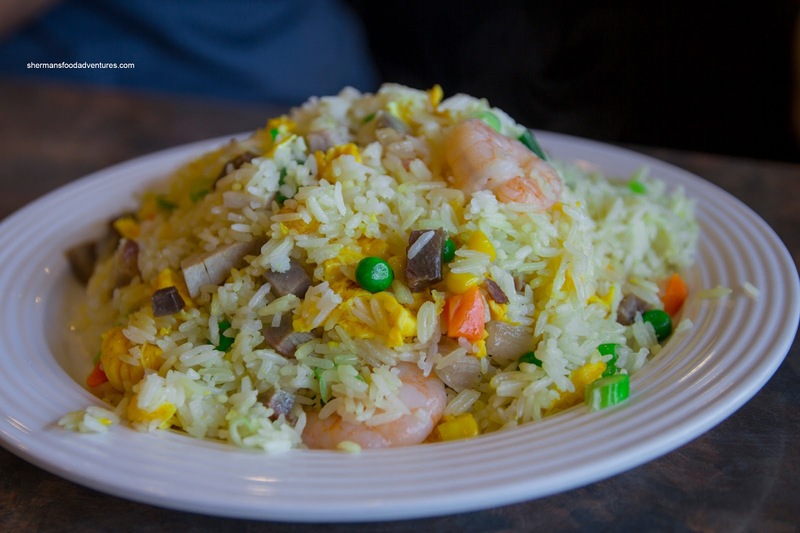 Milhouse wimped out again (much like the time at Jules) and had only one dish - Yeung Chow Fried Rice. It exhibited good wok heat where the rice was dry and nutty. There was ample amount of BBQ pork, crunchy shrimp and fluffy egg. The rice was really flavourful and after awhile was pretty salty. "Not bad" was pretty much our sentiment about the place. Everything met our expectations without exceeding them. Service was decent considering the place was packed. Although the prices weren't exactly high, the portion sizes were quite modest.